Inspired by Jane Austen's Persuasion, For Darkness Shows the Stars is a breathtaking romance about opening your mind to the future and your heart to the one person you know can break it." For Darkness Shows the Stars is a dystopian retelling of Jane Austen's Persuasion, one of my favourite classic novels. With an alluring cover, it follows the story of Elliot North, a Luddite, and Kai, a Post-Reduced, in a post-apocalyptic world. Characters: I saw Anne in Elliot. Her big and caring heart, her strength in a quiet way, her broken heart by Captain Wentworth. I admired her courage for staying behind, taking care of the Reduced on her estate instead of running away with Kai, the boy she loved. I enjoyed how much she grew through the story - she learned how to stand up to everyone who bullied her. However, at the end, I think Elliot acted out of character, but I can forgive her because I'm a huge sucker for love. Kai brought to surface all those feelings I felt when Captain Wentworth was around (those feelings that made me want to smack some sense into him). Nevertheless, I found Kai a bit more vicious than Wentworth, which I guess was because of his upbringing because being treated as a Reduced when he was a Post-Reduced (able to think and protect himself) must have been very difficult. Romance: I'm not fond of abusive relationships (no one in his right mind should be). However, no matter how harsh Kai was to Elliot, I don't see it as an abusive relationship. It resembled a lot the relation between Anne and Wentworth - the Captain felt hurt by the woman he loved (and never was able to forget) and wanted her to feel as hurt as he felt. That said, I enjoy friends-to-lovers-turned-to-foes-due-to-a-misunderstanding relationships and that's the kind of relation between Elliot and Kai. The angsty relationship between them was really heartbreaking. If I hadn't read Persuasion before, I would have been on the edge of my seat to know what was in store for Kai and Elliot. Worldbuilding: At the beginning, the worldbuiling was confusing. Luddites, the Reduction, the Children of the Reduction (CORs)... all these terms were used from the first page and I felt confused because they were no explained. But then, the letters exchanged between Elliot and Kai (which were a very nice touched that reminded me of the original novel) slowly unravelled this new world and how things came to be. If at first I was dubious, then I came to enjoy this vicious world for all those who were not Luddites (and, sometimes, for those who were *cough Elliot cough*). 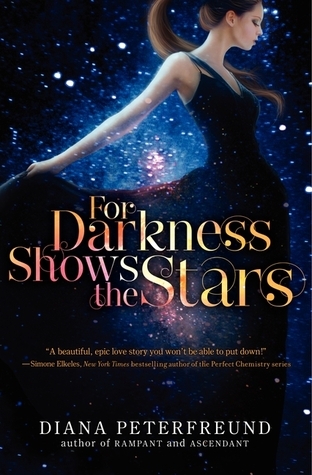 For Darkness Shows the Stars's world grew on me and I couldn't wait to know more about this well-woven dystopia. For Darkness Shows the Stars is a charming retelling of Jane Austen's Prejudice with a post-apocalyptic and dystopian twist.